For generations the Passover Haggadah has been the Jewish text most read and studied by observant Jews. But the premise of Haggadah of the Sages, written by father and son Shmuel and Ze ev Safrai, is that in the time of the Second Temple, the Seder night was not celebrated in the way it is known today. This work, translated from modern Hebrew, traces the progression of the Haggadah, based on hundreds of Geniza fragments, manuscripts, and commentaries of the Rishonim (11th-15th centuries) and Aharonim (16th century onward). The commentary accompanying the Haggadah combines early interpretations with modern research methods. Moreover, there are extensive introductions to and clarification of the Eretz Israel version of the Haggadah which differs somewhat from the Babylonian version recited today. 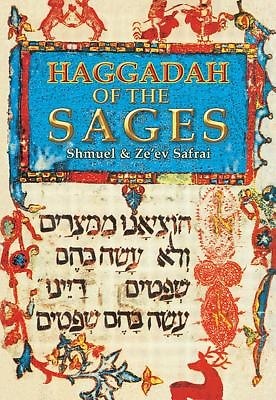 Haggadah of the Sages focuses on central values of Judaism suitable for one and all: the hope for redemption directly from God Almighty, righteousness, compulsory Torah study, remembrance of the Exodus from Egypt, and honoring the commandments.